The purpose and intent of the information presented in this article is not to provide behavior advice or recommendations, but rather to encourage thought and discussion among pet caregivers and their veterinarians about recognizing signs of aggression and the best ways to deal with it. As we get older some of us tend to have a limited supply of patience. Our bodies hurt more, and time alone becomes more valuable. It’s common for those who have been around a long time to spend their days on their own terms, with little patience for things that get in the way of that. This is as true for animals as it is for people. However, some dogs may get aggressive as a result of stressors relating to their age. Dog aggression can be serious business, so it’s important to nip that behavior in the bud. Through talking to your vet, making a note of their triggers, giving them space, and offering them consistency, you can work to reduce aggression in your senior dog. Even the most docile dog can have issues with aggression as they age. Though there are plenty of reasons for this, and plenty of ways to help that problem, it’s still important to take the matter seriously. A dog bite can cause infection, emotional distress, and maybe even legal intervention. A dog can even be put down for biting another dog or person depending on the severity or serial nature of the aggression. If your dog is becoming aggressive in their old age, be sure to take the necessary precautions to keep them and everyone else safe. Keep them up to date on vaccinations: Vaccines work on animals as well as people to eliminate disease. For instance, the chicken pox vaccine has reduced instances of the disease dramatically since it’s been implemented. The same is true for vaccinating your dog for things like rabies. Though it’s rare, it’s still important to keep your dog up to date on their vaccines to keep these diseases from spreading through a bite. Utilize a muzzle: There are plenty of humane muzzles that still allow your dog to eat, drink, and pant, but not bite. Though you should never utilize a muzzle for a dog who is alone, you can still use it as a temporary safety precaution if your dog is around other people or animals who trigger their aggression. Read their body language: If your dog has issues with aggression, it’s important to be aware of your dog’s body language before the situation escalates so you can avoid an altercation. Some common signs of aggression include stiff posture, ears that are pinned back, growling, baring teeth, and an arched back. If you see this, remove your dog from the situation. A change in an animal’s behavior is something you should go to the vet for. If your senior dog is becoming aggressive, it’s important to rule out any medical issues. One of the reasons a dog can get aggressive is due to illness, injury, or confusion, regardless of their age. As a dog ages, it’s common to have some health concerns. 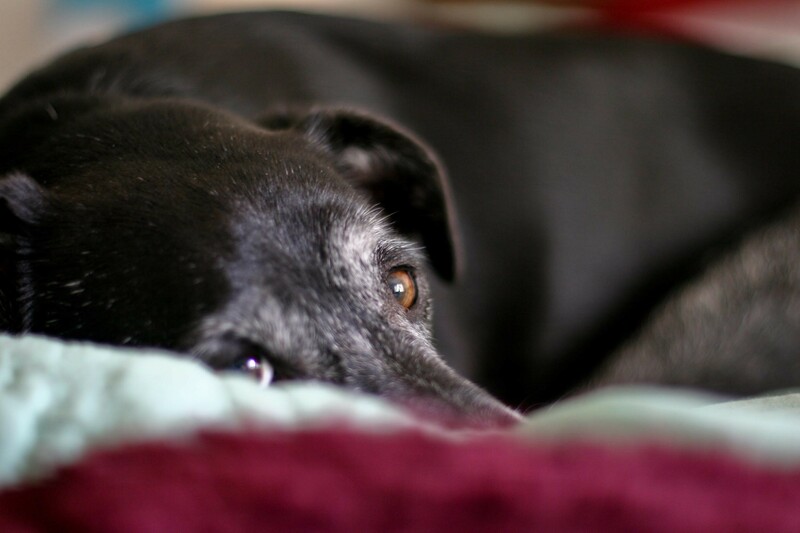 Something like dental pain, arthritis, or vision and hearing loss can trigger aggression in a senior dog. If a dog is experiencing dementia or confusion, these can also trigger aggression. Some of these concerns can be helped with medical intervention, so it’s important to visit the vet before putting them in any other triggering situations. It’s hard to reduce your dog’s aggression if you’re not sure what’s causing it. It might be being startled, loud noises, being touched, a change in their environment, or something else. Senior dogs may be showing their anxiety, stress, annoyance, pain, or confusion through aggression. Pay attention to new stimuli or changes around your home that may be causing a negative response from your dog. Making a note of their triggers may show a correlation to pain or confusion that your vet would like to know about. At the very least, it’ll help you to create an environment for them that eliminates those problems. Sometimes an old dog just needs more space to be comfortable. Help your aggressive senior dog by giving them space and removing them from potentially stressful situations. If you know you’re going to have company over that could trigger their aggression, let your pup stay in another room that is quiet and comfortable. Crate training them can be a great way to give them a safe area they can retreat to if something or someone is giving them anxiety that can cause aggression. Be sure you’re open about your senior dog’s aggression to other family members and visitors so that they know to give your dog some space. The familiar can be comforting to many dogs, especially senior dogs. Consistency can make them feel at ease. Some things are difficult to keep familiar such as introducing a new family member, or moving to a new home. However, keeping their consistency can help them stay calm and therefore less aggressive. Work to keep their schedule and their environment the same. For a senior dog who is confused or senile, familiarity can help to keep them aware. They know how to step that may not cause pain in their joints, and they know when they will get their meals. When new people and experiences are triggers for your dog’s aggression, structure can be a big help. Just as we may need to have “the talk” about senior family members when it comes to helping them live life to the fullest, the same is true of our beloved pets. “Grumpy old men” or “sassy old women” are not descriptors specific to people. Dogs can feel just as grumpy or sassy in their old age. In truth, they deserve to be a little stuck in their ways. They’ve lived their lives chasing Frisbees and watching out for their people, and now they just want some comfort and quiet. Dog aggression is not to be taken lightly, but it’s not something that’s helpless either. Your dog might have health problems or stressors exacerbated by their age. By making a note of their triggers, giving them space, and keeping things consistent, you can help reduce their aggression and keep their senior years golden. Devin roams the Pacific Northwest, bringing his dog, Scrummy, whenever possible. He is a strong believer that nothing can compare to a dog's unconditional love. You can follow him and Scrummy on Twitter.